The Surf Rat (photographed above) is a fly pattern originated by Brian Hastings. 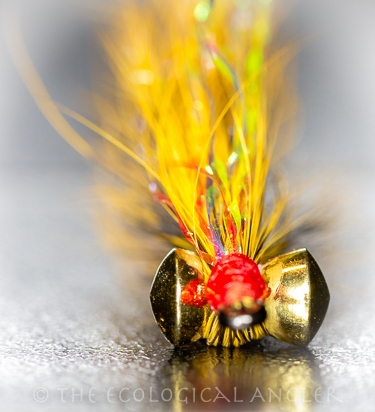 From Gray Bulla - the Surf Rat is "...a consistently productive surf fly that swims upside down Clouser-style. It works well on a variety of species including halibut, corbina, yellow finned croaker, and especially barred surf perch. 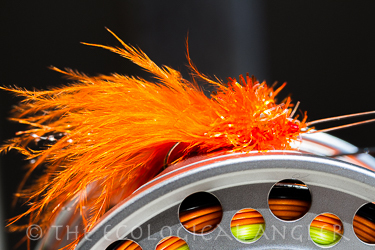 The weighted eyes help get this fly down in the surf and the pulsating marabou, bright colors, and holographic tinsel make this pattern highly visible in the surf." Why orange? 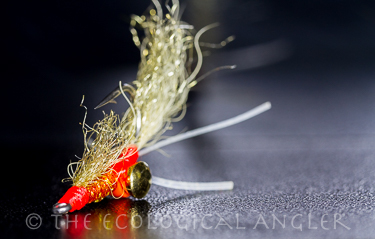 The bright orange color boosts the visibility of the fly in saltwater which is constantly churning with sand, seaweed, and foam. 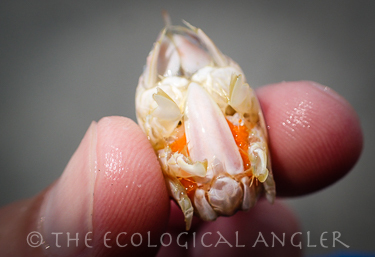 Probably the more important reason for orange - it's a bite trigger for surfperch. I direct your attention to the photographs above and below. 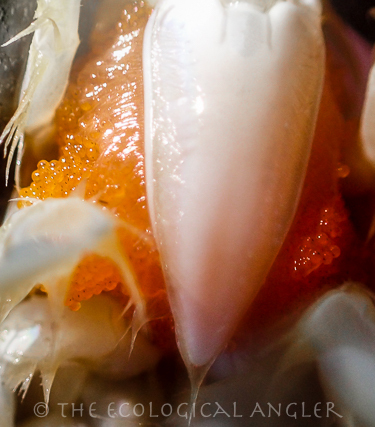 Sand crabs are loaded with tiny roe. These sand crabs hold their roe sacks underneath their shells, but are clearly visible when the crab is moving on the surface. When these crab are loaded with protein rich roe, it's a meal not to be missed! Barred surfperch dominate the catch of most anglers along California's beaches. Barred surfperch range from Central Baja Mexico to Bodega Bay just north of San Francisco. 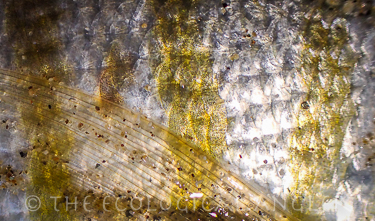 The photo below shows the thick vertical bars that give the barred surfperch it's name. That said, Kirk Lombard surveyed Stinson Beach in Northern California and reported about 60% of the fish caught by anglers displayed either no or only faint barring. Because of the missing bars, they are commonly called California Perch. Where fly fishing the surf places demands on your casting skills, it certainly doesn't place demands on fly selection. I'm sure we all know guys that carry 3 or 4 boxes overflowing with flies to fish a small Sierra creek. To target surfperch, I would be comfortable taking 3 or 4 flies to the beach! And those flies would only get deployed if I broke-off the first one. The key requirements for a productive surfperch fly are: (1) Color, (2)Weight, and (3)Size. My far color will set the tone for your productivity. The color of choice for surfperch is orange, with red a fairly close second. And certainly there is room for creativity, these are California perch afterall. The spectrum of orange hues, going out to say a rootbeer brown, would be worthy of a tie. One such improvement would be to tie the Rusty Squirrel Clouser (photographed above) with a orange tail instead of the rust squirrel tail (as suggested by Glenn Yoshimoto). Weight is the next important criteria for a good surfperch fly. Since surfperch actively feed along the sandy bottom, you'll want to work your fly in that area. 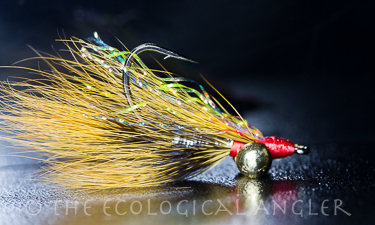 A surfperch pattern tied with brass barbell eyes (photographed above) will be your friend in the turbulent surf. A type 6, sink tip combined with a short leader (e.g., no longer than 6 feet) are required here as well to get the fly down on the bottom. As far as leader length, I generally keep it around 4 or 5 feet depending on the type of surf I'm fishing in. When faced with a big swell and short times between waves, I prefer to go with a short leader of 3 to 4 feet. As far as size goes, I think the sweet-spot for surfperch is size 4 or size 6. The bulk of their prey / forage is not much bigger than the tip of your thumb (e.g., sand crabs). Going with a size 6 fly will definitely give you the most action especially with any of the smaller surfperch.